Apollo 1 Newspaper Fire Philadelphia Inquirer 1967. (Eagles Finally Win the Super Bowl") datedFebruary 5, 2018. It is in good condition. These are the two popular Philly newspapers hot off the news stand! Philadelphia Inquirer and Daily News. THIS IS IN EXCELLENT CONDITION. THIS IS COMPLETE. AS ALWAYS--YOU ARE SATISFIED OR YOUR MONEY BACK! 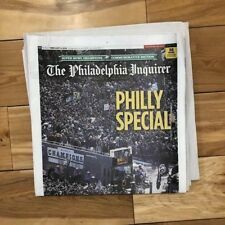 Philadelphia Eagles Super Bowl LII Champions Inquirer Newspaper Reprint Framed! SUPER BOWL CHAMPIONS! Double Matted with acid-free mat boards in the Official Philadelphia team colors. Newspaper date: February 5, 2018. Print is dry mounted to foam board in a vacuum press - nice & flat! Not full newspapers. January 6, 2004 Philadelphia Inquirer pages from Front Section. January 6, 2004 Philadelphia Inquirer pages from Sports Section. January 6, 2004 Philadelphia Daily News pages. Included Newspapers. Philadelphia Inquirer Full Newspaper. Rizzo Is Dead. Philadelphia's Frank Rizzo. July 17, 1991. It is a full paper unread that shows wear from age and storage. The upper edges are bent, it's folded and shows normal age coloring (view photos). Proudly Made In The USA. Philadelphia Eagles Colors Acid Free Double Matting & UV RESISTANT ACRYLIC FRONT & ACID FREE FOAM BOARD Backing To Protect Your Newspaper. Wall Hanging Hardware Included. A Complete newspaper in Mint Condition. This is an issue of the Philadelphia Inquirer newspaper from October 26, 1983. This is a complete copy of the newspaper. There are 96 pages. This newspaper is in overall very good condition. Oct 27, 2008 Philadelphia Inquirer (n ewspaper is not complete, includes just the sections / pages relating to the Phillies. Oct 27, 2008 Philadelphia Daily News (newspaper looks to be complete). ( See pictures). ). See photos for more detail regarding the condition. This is the actual complete edition of The Philadelphia Inquirer from 2/13/1999. The headlines read "Clinton Aquitted". This historic paper is complete and in near mint condition. MAkes an excellent addition to any colelction. Nice shape with general wear. Look at the picture. That's less than it will cost us. Newspaper seems to be good condition for 30 year old newspapers though the edges are frayed with small tears with normal fraying of papers edges and normal discoloring/yellowing that newspaper get with age. Foam Board Backing And Hanging Hardware Included. UV RESISTANT ACRYLIC Front To Protect Your Newspaper. FOAM BOARD BACKING and Hanging Hardware Included. This is an issue of the Philadelphia Inquirer newspaper from December 31, 1999. This is a complete copy of the newspaper. There are 146 pages. This newspaper is in overall very good condition.